Let us turn your firehouse into a superhero headquarters! Win a complete "design overhaul" of the firehouse living quarters, working area or personal area. We will bring in an elite team of interior designers. When we're finished you will be amazed with your brand new headquarters! Did you miss the deadline to enter? You still can get an auto quote from California Casualty by clicking here. 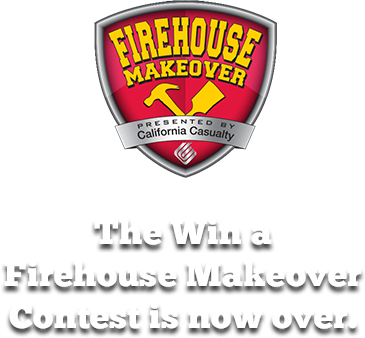 © 2014 California Casualty, "We Protect American Heroes"
Firehouse Makeover Terms © Conditions questions regarding this contest may be directed to California Casualty Management Company ("California Casualty") at (650) 572-4339. Eligibility: Entrant must be currently employed as a Firefighter, Volunteer Firefighter, or member of an association listed below. Entrant must be 18 as of July 1, 2014 and a resident of the fifty (50) United States including the District of Columbia. Residents of AK, HI, MA, MI, NC, WI, PR and NY are NOT eligible. In the following states, a resident must be a member of the associated group to be eligible: AZ, CA, CO, KS, KY, IN, MA, MO, NE, OH, OR, TX, WA, PA, and UT. California Casualty will be solely responsible for selecting the winning firehouse, interpreting contest rules, and all other matters related to the contest. It's decision will be final. **The winner will be notified, as close as possible to the timeline proposed in the drawing calendar, that the fire station that they entered on the contest entry form has been selected as the recipient of the firehouse makeover. The prize will be in the form of a firehouse makeover not to exceed $10,000 and makeover the final determination of the selection of any item on or not on the predetermined list. Go to the California Casualty homepage.